This fine flower arrangement is the very picture of happiness and joy. Whether you are celebrating somebody's birthday, a promotion, graduation, or any other happy occasion, this sunflower bouquet. 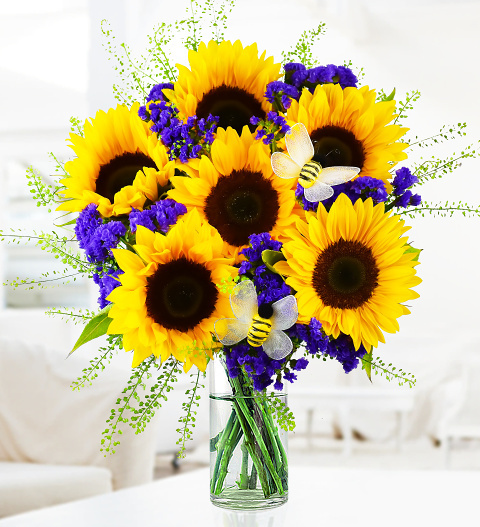 Our expert florists have chosen British grown sunflowers paired with striking statice and green bell to bring it all together. Topped with beautiful bee picks, this delightful flower arrangement will steal the show in any room! Spoil somebody special when you spoil them with a floral display they will cherish. Chocolates may contain nuts.